Drinker Biddle is a national, full-service law firm providing litigation, regulatory and business solutions to public and private corporations, multinational Fortune 100 companies and start-ups. Since 1849, we have built a reputation for outstanding legal results and a sophisticated, forward-thinking approach to every client engagement. Our nearly 600 lawyers across 13 offices combine a comprehensive range of legal services with significant national roles in industries, including—but not limited to— insurance, education, financial services, health care, pharma and life sciences, and retail. Through deep industry knowledge and a commitment to excellence, clients can rely on us to deliver the counsel and insight needed to win complex class actions, close billion-dollar transactions and stay ahead of ever-changing regulations. 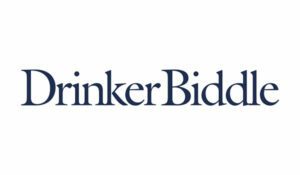 For more information, please visit www.drinkerbiddle.com.